Our referral program started working from June of 2017. Cheetaho team wants to give extra free images for those, who would like to spread the world about Cheetaho image optimization service. More images you optimi, the faster your website will be! So first of all what will get our client if he will recommend our image optimization tool and WordPress plugin. Tell your friends about CheetahO and we will add for both 50 images for new user registration. 200 images for every referred friend that signs up for a paid plan. There is no limit to the amount of images you can earn. How use image optimization service referral program? First of all you need to share your unique link. Link can be found in Cheetaho admin panel https://app.cheetaho.com/admin/referral. The more you share the link, the more likely that someone will use it. 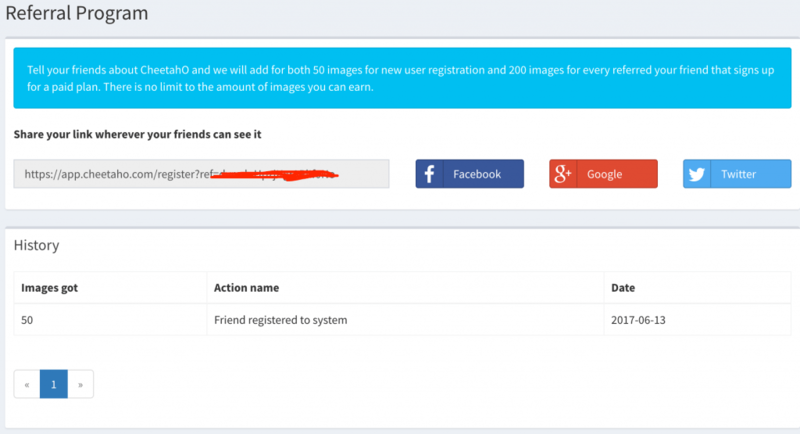 As soon as a friend sign up with your link the free images will be assigned for both. How can I share my link? At this moment link can be shared using Facebook, Twitter and Google+ social networks. Do not want to use socialnetworks? Copy link from field and send it to your friend to suggest to use Cheetaho image compression and optimization tool. Thank you for helping to accelerate our project developing.